Having lived with The New iPad for two weeks (iPad G3 for the rest of this article), here are some thoughts. As the owner of a first generation iPad I skipped the iPad 2, so all of my comparisons are between the two iPad’s I have owned and used daily. My initial thoughts on the screen were amazing resolution, colours too warm. In direct comparison to the iPad G1, the G3 screen is much warmer, or yellow tinged, than the G1 and G2 iPad’s. Having now lived with the G3 screen for two weeks, I rarely notice the warm colour any more. How noticeable the warmth of the screen is seems to be related to the ambient light. In Daylight it’s fine, under Tungsten lights it looks a little bit warm or yellow. The initial impression of the doubled resolution (2048 x 1536) screen doesn’t go away. It’s stunning, making photo’s look incredibly sharp, and 1080p video very crisp. 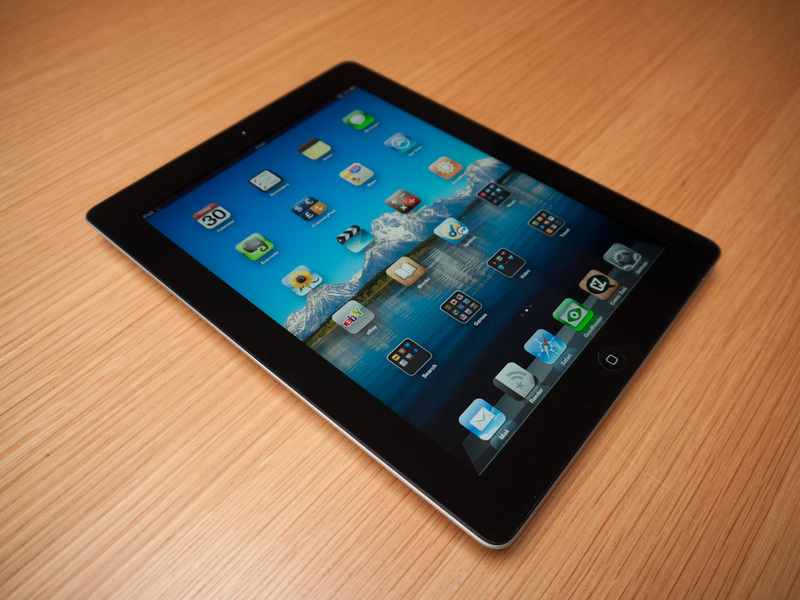 The biggest problem for early adopters is that many iPad apps are not yet updated. The new screen makes anything running at 1024 x 768 look blocky, to the point where I switched to new pdf and rss readers until my favourites were updated. One app that worked at the higher resolution from the day the iPad G3 was released is Comic Zeal, my comic reader of choice. The interface is still mostly pre-retina resolution, but the comic images are super sharp. It’s no longer necessary to zoom into the page to read the small print, the new limitation on what you can read is your eyesight instead of the iPad screen. If there’s a down side to the new screen resolution it’s that other aspects of the iPad have not kept pace. More on that in the Storage section. The increased colour saturation of the new screen is also impressive, but doesn’t cross the line into unrealistic colour. Photo’s look vibrant, but also natural. I looked at some mobile phones with OLED screens a few months ago, and hated the over saturated neon colours that many reviewers have praised. The iPad G3 is fast. It may not be faster than the G2 model, but it’s massively faster than the G1. Web pages in Safari often appear in one instantaneous reveal after a couple of seconds, rather than piece by piece over a few seconds. Moving between apps using the four finger swipe gesture is smooth. Any form of slowdown or lag is very rare, making the iPad G3 a much more rewarding and smooth device to use. Going back to Comic Zeal, when new comics are added through iTunes there is a delay on the next launch of the app while the comics are imported. This is much shorter with the iPad G3, so much so that I no longer leave the iPad for a while and go do something else. As the great IT guru Moss said, memory is ram. The iPad G3 is widely reported as having one Gigabyte of ram, compared to 512 megabytes on the iPad G2 and 256Mb on the G1. When first released the iPad G1 ran iOS 3 and could run one app at a time. Performance was good as the limited memory was only asked to handle the OS and one app. iOS 4 brought Apple’s limited multitasking, which I always found the iPad G1 struggled with. Switching from the Safari browser to another app and back again would result in the open web pages reloading. The best way of minimising this reloading or app restarting was to keep only a few apps in memory. The Gigabyte of ram offered by the iPad G3 mostly eliminates this problem, and allows fast switching between open apps. Safari will keep several tabs open for instant access upon returning to the app. While the iPad has always been touted as an “instant on” device, the increase in responsiveness means this is now far more accurate than in previous generations. This is the one aspect of the iPad G3 that disappoints. Moving from a 32Gb iPad G1, my thinking was that a resolution doubled device would need as much storage as possible to handle HD video and higher resolution photo’s. Opting for the 64Gb model proved to be sensible, but I can’t understand why Apple didn’t offer a 128Gb model. Even if Apple kept the 16Gb version, a 128Gb model would have offered ample space for HD video for those who wanted to pay a bit more. iCloud storage isn’t an option, as until fast wireless access to the cloud is available everywhere we are stuck with local storage. I expect the market for iPad extra storage devices to grow. To put this into perspective, on my iPad G1 I had seven holiday video’s exported from iMovie at the Large size, 960 pixels wide. These required 7.4Gb of space on the iPad. One of the video’s was 690Mb in size and around 30 minutes long. For the iPad G3 I exported the same video’s at 1080p, which needed 35Gb of my 57Gb available iPad storage space. The 680Mb video from the iPad G1 grew to a 3.8Gb 1080p file on the iPad G3. Dropping the resolution to 720p reduced the required space to 19.6Gb, with the one mentioned file dropping to 1.8Gb in size. While not quite as sharp as the 1080p versions, the 720p video’s are very close in quality and a huge improvement over the Large versions. As with every previous iPad, iPhone and iPod, there is no option to add extra storage using memory cards. Apple sell the camera connection kit for importing photo’s, but unless your iPad is jailbroken I know of no way to play video from an SD card. While the front facing camera remains the same as the iPad G2, the rear facing camera on the iPad G3 gets a big upgrade to a 5 megapixel version of the iPhone 4S camera. Quality of the rear facing camera is good, but as a stills or video camera its value is limited by the size of the iPad. A great camera on a mobile phone makes perfect sense, but who will carry around an iPad for shooting photo’s and video? The one area I see the rear facing camera showing its value is with augmented reality apps, overlaying information and content over the camera view. The iPad G3 has a good enough camera and plenty of processor power to make this a smooth experience. City or museum guides could be amazing with this. The lack if quality improvement with the front camera is a little disappointing, but this may be to limit data rates rather than a belief that the current camera is good enough. This is one area I can’t comment on, as I have only used the Wifi iPad G3, and the UK does not have fourth generation mobile data services. Coming from the first iPad, the G3 is slimmer and lighter, so I can’t comment on the increase in thickness and weight over the G2. One aspect that doesn’t impress is how slippery the iPad G3 feels, as while the aluminium finish may be attractive it does not provide a secure grip of the device. I picked up a cheap gel case on eBay that covers the back, sides and front edges of the iPad, giving massively improved grip and resistance to knocks without adding much size or weight. It also fits easily inside the Belkin zip case I use when the iPad goes into a bag, and with both cases together costing around twelve pounds I have great protection at a bargain price. There’s little to say about the apps available for the iPad G3, other than there are a huge number available, and upgrades for the retina screen are coming slower than I would like. Of the 116 added apps on my iPad, 27 were upgraded for the new screen two weeks after release. Apple doesn’t say much about the hardware inside the iPad. There’s still a dual core processor and new quad core graphics, but beyond that the numbers are not mentioned. Unlike Android tablets listing hardware specifications as a way of differentiating themselves from the competition, Apple has always been more interested in telling us what we can do with the iPad. Having used computers for over 30 years, I like the Apple approach. I can edit my video in iMovie, export to iTunes and copy to iPad fairly easily. Getting PDF files or comics onto the iPad through iTunes is a bit or a chore sometimes, but the files are then in the right place on the iPad. Some prefer the openness Android, with access to the file system and memory cards, but this introduces the task of managing the file system yourself. Neither system is currently perfect, but my feeling is that the majority of normal tablet users of average technical ability would be more comfortable with Apple’s system. That’s just my opinion, the true test is sales figures and market share. Launched with iOS 5.1, Apple are sure to add some new features to this summer’s iOS 6 that will show what the latest iPad can do. One of the best things about Apple’s “walled garden” approach is that owners of older devices still get iOS updates. Even my two and a half year old iPhone 3GS is running the latest version of iOS, albeit with some features missing. I find it strange that some new Android phones and tablets are still launching with Android 2.3.5, with no sign of an update to Android 4 which was launched last year. Again that’s just my opinion, and the average phone user just wants something that works so is likely not concerned with software updates. Greeted by some as a disappointing incremental update, the iPad G3 will continue to sell in huge quantities. While the retina screen, faster mobile data and extra ram are great improvements, it’s the ecosystem that makes the iPad the best tablet for the average user and drives sales. Owners if the iPad G2 will likely find the G3 iPad an unnecessary upgrade, unless they do a lot of reading. For iPad G1 owners or those new to tablets it’s a great buy. Do you ever run into any web broser compatibility issues? in Safari. Do yyou have any recommendations to help fix this issue? a blog article or vice-versa? My site discusses a lot of the same subjects as yours and I think we could greatly benefit from each other.